Quality Control Inspector lays the groundwork for individuals interested in understanding and expanding their knowledge of monitoring and inspecting weatherized units. Students will thoroughly cover sessions on regulations and standards, desk monitoring, tools of the trade, building assessment, interpretation of infrared imagery, in-progress monitoring, and what to include in a report. The course follows the Department for Energy’s standardized curriculum for Quality Control Inspector and has been modified to align with the NREL Job Task Analysis for Quality Control Inspector. The structure of the course includes lecture, dialogue and practical experience through hands-on skill sets. Additionally, this course can serve as a review to prepare participants for the Building Performance Institute’s (BPI) written and field exam for certification as a Quality Control Inspector. Learn more about Home Energy Professional certification. 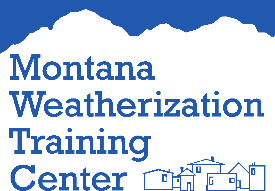 As a BPI Test Center, Montana Weatherization Training Center proctors both exams for additional fees. These exams can be arranged by request. This is a lecture-lab course geared toward students who have had experience in the field as an Energy Auditor or as a Crew Leader. Most topics are covered first in the classroom and then covered again in the training lab. Student participation in discussions in the classroom and in the lab exercises is very important. This course has a written final exam and student participation is graded as pass/fail.